Every year I envision raspberry crisps, raspberry cobblers, and frozen berries in the middle of winter. 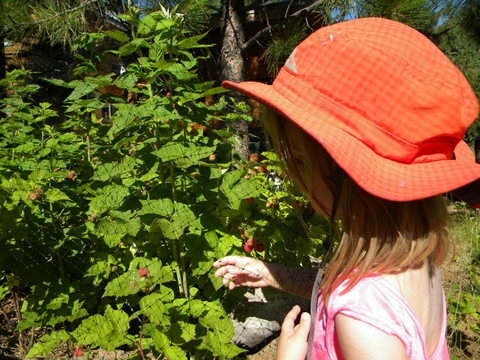 But the reality is that our raspberries are plucked and consumed just as soon as they ripen. Who can resist? M. is learning to tell the ripe from the not, and the adolescent robins have reappeared to feast as well. 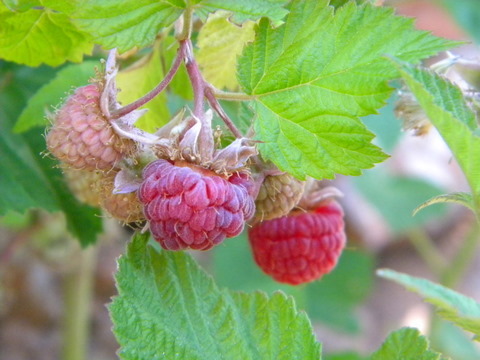 We started our raspberry crop with twenty-five bare-root canes of Nova berries in 2008. Just a handful of berries that year, but additional vegetative canes (primocanes) established. In 2009, the previous year’s leafy canes became floricanes, flowering and setting fruit, with new vegetative canes filling in the beds. Now we have hundreds of canes in our beds, but still, there are never enough raspberries!